On the evening of February 27, 1933, the Reichstag was set on fire. 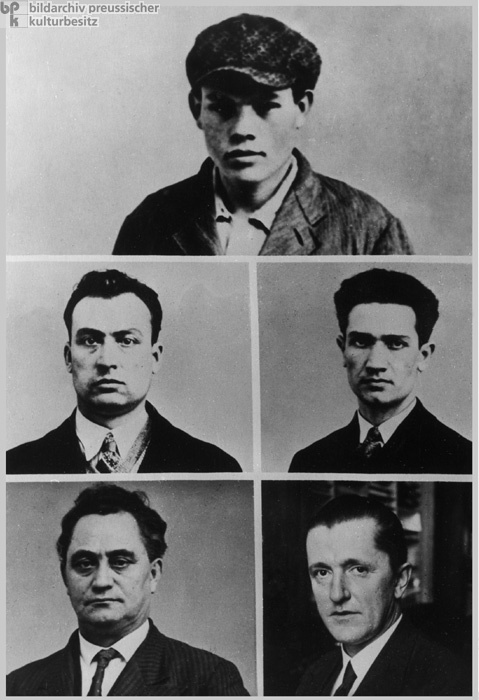 The alleged arsonist was Marinus van der Lubbe (top row) (1909-1934), a young Dutch left-wing radical. Van der Lubbe was arrested on the spot and immediately claimed sole responsibility for the crime. But the Nazi leadership planned to make use of the case for its own ends. Contrary to all evidence, the Nazi press stated that the Reichstag fire had been meant as the signal for a "Bolshevist revolution" – one that the Nazi leadership had fortunately managed to thwart at the last moment. A large-scale show trial was supposed to prove that the German Communist Party (KPD) was behind the affair. Starting on September 21, 1933, van der Lubbe and four other Communist functionaries stood trial for arson and high treason at the Reich Court in Leipzig. The other defendants were Ernst Torgler, chairman of the Communist Party faction in the Reichstag (bottom row, right); Georgi Dimitrov, the Bulgarian Comintern representative for Western Europe (bottom row, left); and his Bulgarian colleagues Blagoi Popov (middle row, right), and Vasil Tanev (middle row, left).